TrackMyJourney is a website set up to manage, view and share tracks recorded from GPS devices. Used with a compatible Mobile Phone, Bluetooth GPS Receiver and our TMJ-Mobile software, it can also display your live location on a map, and allow others to follow your footsteps. 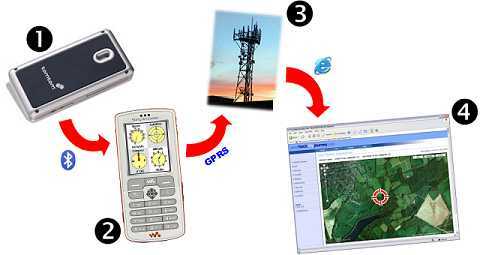 Firstly you need a GPS Receiver (1) which calculates your location. This is then sent via bluetooth to a compatible mobile phone (2) running TMJ-Mobile. The phone processes the data and transmits your location via the mobile network (3) to the TrackMyJourney server. Vistors to www.trackmyjourney.co.uk (4) (to whom you have granted access) can then view your live location online. If you would like to try it for yourself, please click here to register.